The first book I read to my students every year is Thank You, Mr. Falker by Patricia Polacco. It sets the tone that I am there as a partner in their learning. We will solve issues together. 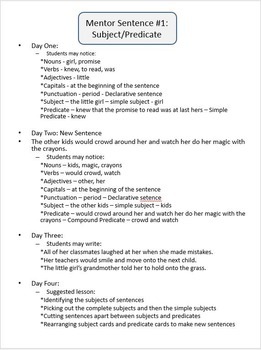 This pdf formatted week-long lesson plan is one part of my 10 week Mentor Sentence Set 01 packet. 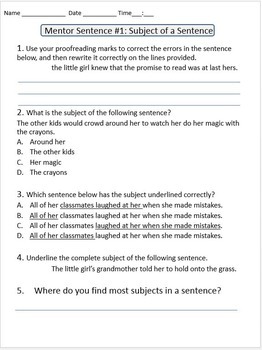 If you are thinking of trying Mentor Sentences in your own classroom, this is a perfect place to start. Disclaimer: Instructions for use are not included in this packet. 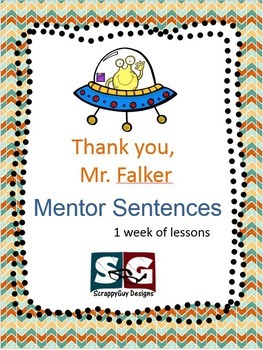 Please look for them in the full Mentor Sentence Set 01 packet. Packet includes two introduction slides and a seller's page slide.